A strong support network has enabled Matthew Ong Kai Jing, Khaw Yee Ming and Tessa Ng Pei Ying to benefit from an innovative learning experience at INTI International College Penang, and opens a path for them to study in the United States under full scholarship awarded by the University of Kansas (KU). 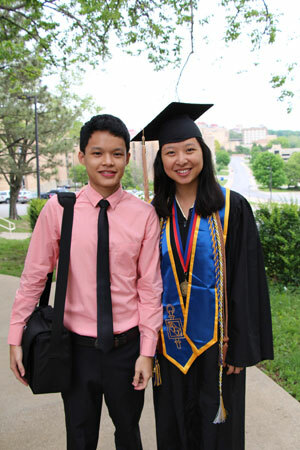 Matthew Ong (left) finds inspiration in his sister, Alyssa, who recently graduated from the University of Kansas. Having successfully completed two years of study in the American Degree Transfer Program at INTI under the guidance of highly experienced and qualified lecturers, the trio will complete the remaining two years at KU, a major public research and teaching institution, for their bachelor’s degree. “INTI provides many opportunities for us to learn and excel within and beyond the classroom. The numerous workshops organized during the course of my studies have benefitted me immensely by preparing me for life in the US. Additionally, INTI ensured that the course credits I attained in the American Degree Transfer Program are successfully transferred so that I can take advanced courses right where I left off,” said Tessa, formerly from SMK Convent Green Lane. “When I first joined INTI, I had difficulty expressing myself in English. I received a lot of help and support from my lecturers, and utilized the opportunities and resources for individual development available to help me leave my comfort zone. By interacting with people from diverse backgrounds within the campus community and by experiencing the world for myself through activities and events on and off campus, I was able to build up my self-confidence and improve my communication skills, and am now able to speak and write comfortably in English,” said Yee Ming who is majoring in General Psychology at KU. Matthew Ong, who currently serves as president of AUPEC, the American University Program Student Council, receives support and inspiration from not only his friends, but also his sister, Alyssa Ong, an INTI alumnus. Alyssa was University of Kansas’ Undergraduate Research Award recipient for her work on a life-changing volunteer programme and had represented KU, INTI and Malaysia at the Clinton Global Initiative University in the US, where students, youth organizations, topic experts, and celebrities come together annually to discuss and develop innovative solutions to pressing global challenges. “I attended my sister’s graduation earlier this year and seeing her success has motivated me to not only work hard at my studies but also engage in extracurricular activities. At INTI, my sister was able to hone her leadership abilities through wide-ranging events and activities, and now I am experiencing what she has gone through in juggling studies, student activities, family and sports. As I priotize my goals and responsibilities, I am learning to manage my time more effectively while leading an active lifestyle in an exciting learning environment,” said Matthew. The American Degree Transfer Program has provided students the opportunity to experience a seamless transition from INTI to over 300 universities in North America, where they have the chance to experience the world in myriad ways, make their own discoveries and realize their true potential through an education that empowers learners. Given INTI’s strong and long-standing ties with US universities, coupled with its alumni’s impressive record of achievements, both on and off campus, many universities have accorded exclusive scholarships to INTI students. Academics from US universities also regularly visit INTI to present talks and share their knowledge and experiences with students, thus providing them the added advantage over their peers.